Ordered replacement foam surrounds for the low end drivers in my Dahlquist Dq-12's. They arrived in a rigid box three days later with instructions and a tube of glue. The job itself was easy to do, and I've never done this before. 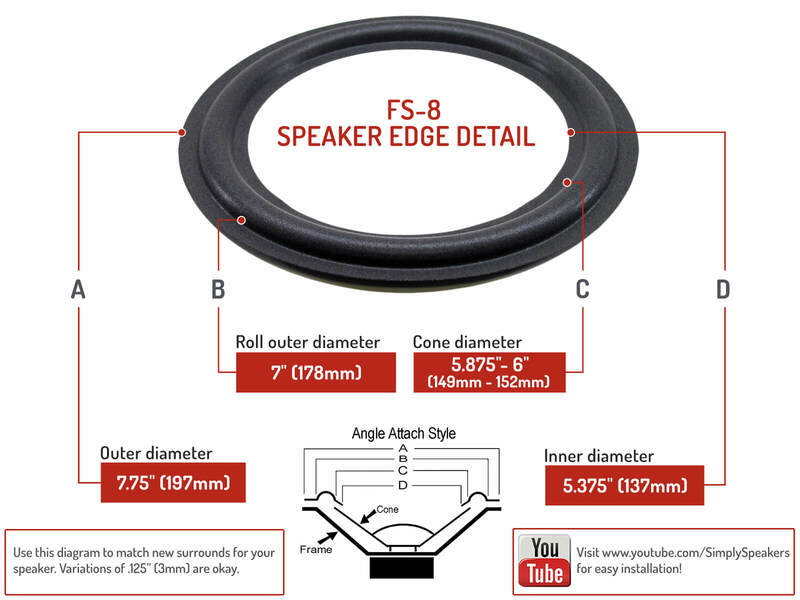 There's nothing to "centering" the speaker, and the shims that other surround replacement dealers include seem totally unneccessary, as the speaker naturally wants to sit in the centered position. Gluing the surround on was easy and I had no anxiety over getting it right. The directions provided were easy to follow, and the surrounds themselves are made of a supple yet tough material. When I put the repaired speakers into use, they sounded excellent, even at ear-splitting volume with the bass turned up. I've now brought a pair of speakers back to life that someone spent over a thousand dollars to purchase when new, and which I was given for free! This proves that old speakers with no more than rotted foam surrounds are only twenty-five dollars and about one hour of work away from working like new. I would order this kit again anytime, and there is no reason to pay a repair place to do it for you-Simply Speakers came through for these Dahlquists and I'm 100 percent satisfied and basking in great sound-thanks. The speaker foam replacement units I purchased worked perfectly. The step by step instructional video on YouTube was very well done and extremely helpful. I was able to replace the speaker foam quickly and inexpensively. Great product and great service! I recently used the Dahlquist 8" Foam Speaker Repair Kit to rebuild a set of Dahlquist DQ-12 speakers that I had purchased from a distant seller via eBay. You can imagine my distress upon opening the shipping cartons and then discovering crumbling foam rubber around the woofers. Worse, the woofer cones had fallen out of spider frames and were dangling by just the voice coil connecting wires! I had angrily considered filing damage claims against the carrier, or suspending payment to the seller and demanding repayment and return of defective merchandise. But an online search revealed that Simply Speakers offered inexpensive materials and instructions for repairing these audiophile quality loudspeakers. With some careful manipulation, these loudspeakers, which are no longer sold or supported by a defunct manufacturer, were put back into working order. Constructive criticism that I may offer is to offer a replacement foam kit with an angled edge that closely matches the steeper angle of the "long throw" cones that were used in these Dalquist speakers. It was quite tricky finding a sweet spot that didn't scrape or rub the voice coil against the permanent magnet, but with continued manipulation and adjustment while the special adhesive was setting up I was able to effect the repair. I'm now thoroughly enjoying these loudspeakers in my audio listening room. So thanks, Simply Speakers! 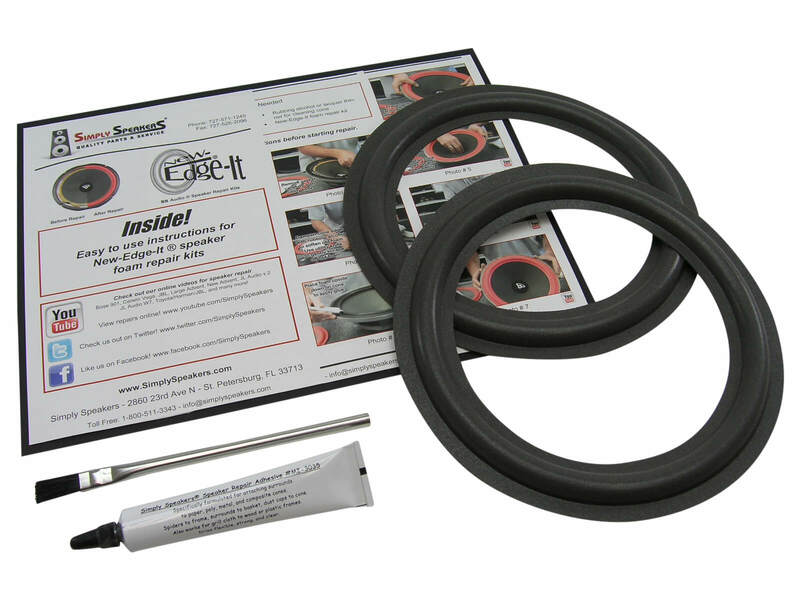 Everyone came out a winner with your repair kit. I had little hope for my Dalquist speakers. The foam was gone. But a friend suggested Simply Speakers and with some doubt I ordered the kit. Fantastic. The instalation was easy, the fit was precise, the glue held and still holds and the speakers are like new. Great product. Dahlquist: DQ-12, DQ12, DQM-3, DQM3, (Magnat) DQM-5, DQM5, (Magnat) DQM-7, (Magnat) DQM-9 Compact, MC-201, MC201, X4515 (1056, 9014), Magnat 2135, and many more!